Where I got it: I got the wooden lazy Susan pictured here at Target several years ago. But Lazy Susans come in a variety of materials including wood, metal and plastic, and they’re pretty easy to find at stores that carry containers and other organizing products. Here’s a link to a similar wooden Lazy Susan. Why I love it: In general, what I most love about a Lazy Susan is that it—or rather she—makes what would be unusable, invisible and hard to access storage space easy to reach and see. 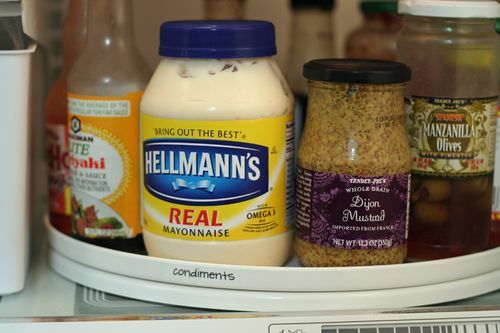 You can use a Lazy Susan on a deep shelf (such as in your refrigerator or in deep closet) and suddenly, the stuff in the back is no longer out of sight or out of mind. Just give Susan a quick spin, and viola! you have easy access to all those things that just moments before were hiding in the back of that deep, dark storage area. How clever is Susan? I use my wooden Lazy Susan out in the open in my scrapbook room, but being able to give her a quick spin makes all my frequently used tools easy to see and access. (Plus, I love how it looks!) I’ve also used the wooden Lazy Susan for fondue dinner parties, which makes for less passing of sauces and raw food, and more time to for chatting and leisurely cooking the fondue. Do you use Lazy Susans anywhere in your home? If so, I’d love to hear how you use yours! Thanks for sharing. I have a lazy susan in the cupboard with my spices and one (two tiered) on my scrapbooking table, LOVE it. I have a 2 tier and a 1 tier in my spice rack cabinet and I love it…Smartest thing I ever did for that cabinet! I have one, but my dd loves spinning it around, so its in storage! But I do love them! Yes- I have one in my fridge that’s indispensible – and another in my pot cabinet. Makes it easy to get to the pots stored in the back, which is vital in a small kitchen. I have mine too. :p thanks for sharing it to us. I love the lazy Susan. I use ours on the kitchen table. Half of it is dedicated to school supplies,the fruit bowl and the other half is for dinner supplies– napkins, salt & pepper. 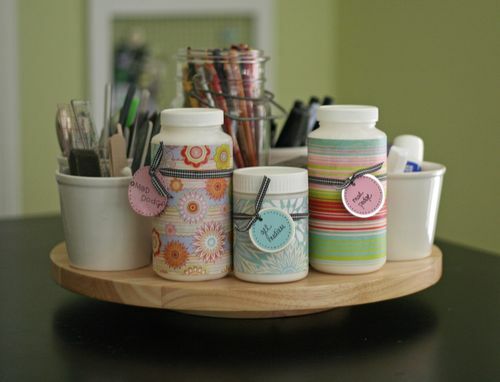 As the kids do their homework at the table, the lazy susan holds the supply cup–pencils, rulers, erasers,etc. With one spin, it is for homework and then with another, time for dinner. I have three of them. Two in my pantry for sauces, oils and vinegars and one in the kids playroom for art supplies. I got one at Ikea and the other two at thrift stores. I will buy them any time I see them – they are so handy. I never thought to use one in the fridge but, d’oh, that is a fantastic idea! I utilize it for spices (usually small or oddly shaped containers) and flavoring oils. (Think Loranns) I also use one to decorate cakes. SO much easier. Love lazy Susans! Use them with clients all the time!